You will be given a reference e-book to read which has 186 pages And the test will be based on that e-book , you can take final test within 1 year of purchase. Graphic design is popular for being a creative process which involves a designer and a client who are in charge of completing a graphical piece which aims to convey messages to an audience. It also refers to numerous professional and artistic disciplines that are primarily concerned about visual presentation and communication. It is a combination of formal characteristics and creativity while using a marketing approach centered on audience which is effective in creating a desirable visual communication. Different methods are now used in graphic design and these include creating and combining symbols, works and images as a means of creating a more visual representation of messages and ideas. It should also be noted that an expert graphic designer is capable of combining visual arts, typography and page layout strategies as a means of producing the most desirable graphical results. Graphic design also has a wide range of uses. These include logos and branding that are essential in building identity, books, magazines, newspapers and any other materials that are extremely useful in publications, product packaging and advertisements. It should also be noted that one of the most essential features of graphic designing is composition which is extremely useful especially if you are planning to use diverse elements or pre-existing materials. It is also important for you to keep in mind that graphic design is a popular process which is creative enough that it combines technology and art as a means of communicating ideas to a specific audience with the help of communication tools such as typography and images. If you want to learn graphic designing, then it is important for you to consider enrolling in the graphic design certification program which is now available at Brainmeasures. This graphic design course can work perfectly for you if you have longed to become a graphic design expert because it covers all the information and aspects that you need to know to become a real expert in this specific industry. By taking part in this commendable online certification program, you will find it easier to access its graphic design training which covers everything about graphic designing including its benefits, the kind of materials that it produces, the different communication tools that you can use in communicating ideas through graphic design and the most effective techniques that you can use to produce the most desirable results out of graphic designing. You will never regret enrolling in this certification course because it will reward you with a graphic design certificate which is effective in showcasing your knowledge and skills in this area. How to effectively articulate designs? 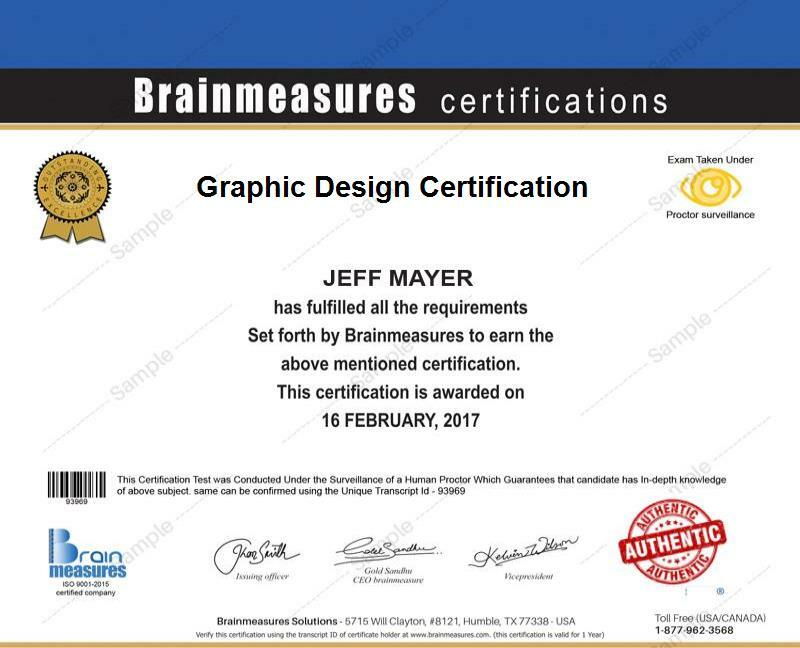 Everyone who wishes to gain a more complete understanding about graphic designing can be greatly benefited by taking part in the graphic design certification program which is now available at Brainmeasures. This certification course caters to the needs of aspiring and existing graphic designers, digital artists, desktop publishers, product designers, web designers and any other individuals and professionals who dream of significantly improving their skills in graphical designing especially in the field of creating layouts and designing, designing logos, clipart and maps and preparing your creative files for printing. Earning a higher level of salary is also greatly possible after you successfully complete your graphic design certification course. With the help of your graphic design certification, it will be easier for you to get the position of a graphic design and production coordinator which gives you the chance to receive around $47,000 to $70,000 per year. It is also greatly possible for you to work as a graphic design manager which allows you to earn around $65,000 to $114,000 annually.